In about 1500 B.C., 1000 years after construction of the famous pyramids of Giza, the Egyptians began burying their pharaohs in the “Valley of the Kings.” The best known of the dozens of pharaohs entombed there was actually one of the least important, which ironically explains his current fame. 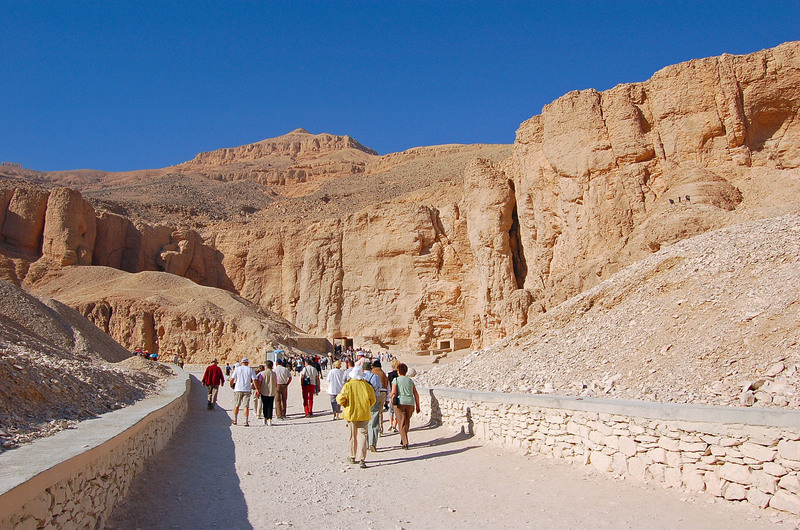 The Valley of the Kings is on the west bank of the Nile River near the modern city of Luxor, called Thebes by ancient Egyptians. The site was apparently selected because of the large pyramid shaped rock overlooking the valley. The area’s relatively soft limestone allowed Egyptian workers to dig steep shafts extending hundreds of feet to underground burial chambers enclosing a giant stone sarcophagus. Along all the walls and ceilings artisans painted elaborate scenes of the pharaoh’s life and life with the gods, some of them intended to give the dead pharaoh help with questions asked at the final judgment. The pharaoh’s earthly possessions were buried with him for later use if, as expected, he survived that judgment. To prevent looting, as had happened at the pyramids, the entrances to the tombs were scattered around the valley and concealed behind tons of limestone. But the camouflage did not work and the tombs were systematically raided as security lessened with Egypt’s declining resources in about 1100 BC. Tomb raiders checked off the pharaohs as they found each tomb and eventually concluded they had found them all. But they missed a pharaoh named Tut-ankh-amen who had died at age 19 after a short reign and had apparently been left off the dead pharaohs’ lists. The discovery of King Tut’s tomb in 1922 created a world-wide sensation. Today the 3500 items of gold and other rich materials found in his tomb, although probably a relative pittance compared with what was buried with more important pharaohs, are the primary attraction of the Egyptian Museum in Cairo. Unlike all the other pharaohs, King Tut’s mummified body is still in his tomb. When King Tut began his reign at age 9, he was called Tut-ankh-aten in honor of Aten, the god his father, King Akhenaten, had declared to be the only true god in history’s first known instance of monotheism. The young pharaoh, probably pressured by powerful priests, reversed his dead father’s decrees, restoring worship of Egypt’s traditional gods. The young king then changed his name to Tut-ankh-amen to honor Amun, the most important god at the time. The Valley of the Kings is open to the public and entry to the now well-lighted tombs is permitted on a rotating basis to protect their magnificent art from crowd damage. The small tomb of King Tut, undisturbed for 3300 years, is a tribute to the benefits of obscurity.